Of the various expressions of right-wing hysteria that have flowered over the past three years—goldbuggery, birtherism, death panels at home and imaginary apology tours by President Obama abroad—perhaps the strain that has taken deepest root within mainstream Republican circles is the terror that the achievements of the Obama administration may be irreversible, and that the time remaining to stop permanent nightfall is dwindling away. The Republican Party is in the grips of many fever dreams. But this is not one of them. To be sure, the apocalyptic ideological analysis—that “freedom” is incompatible with Clinton-era tax rates and Massachusetts-style health care—is pure crazy. But the panicked strategic analysis, and the sense of urgency it gives rise to, is actually quite sound. The modern GOP—the party of Nixon, Reagan, and both Bushes—is staring down its own demographic extinction. Right-wing warnings of impending tyranny express, in hyperbolic form, well-grounded dread: that conservative America will soon come to be dominated, in a semi-permanent fashion, by an ascendant Democratic coalition hostile to its outlook and interests. And this impending doom has colored the party’s frantic, fearful response to the Obama presidency. The GOP has reason to be scared. Obama’s election was the vindication of a prediction made several years before by journalist John Judis and political scientist Ruy Teixeira in their 2002 book, The Emerging Democratic Majority. Despite the fact that George W. Bush then occupied the White House, Judis and Teixeira argued that demographic and political trends were converging in such a way as to form a ­natural-majority coalition for Democrats. The Republican Party had increasingly found itself confined to white voters, especially those lacking a college degree and rural whites who, as Obama awkwardly put it in 2008, tend to “cling to guns or religion.” Meanwhile, the Democrats had ­increased their standing among whites with graduate degrees, particularly the growing share of secular whites, and remained dominant among racial minorities. As a whole, Judis and Teixeira noted, the electorate was growing both somewhat better educated and dramatically less white, making every successive election less favorable for the GOP. And the trends were even more striking in some key swing states. Judis and Teixeira highlighted Colorado, Nevada, and Arizona, with skyrocketing Latino populations, and Virginia and North Carolina, with their influx of college-educated whites, as the most fertile grounds for the expanding Democratic base. Obama’s victory carried out the blueprint. Campaign reporters cast the election as a triumph of Obama’s inspirational message and cutting-edge organization, but above all his sweeping win reflected simple demography. 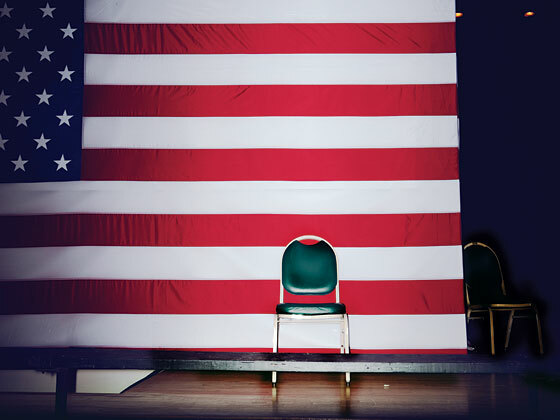 Every year, the nonwhite proportion of the electorate grows by about half a percentage point—meaning that in every presidential election, the minority share of the vote increases by 2 percent, a huge amount in a closely divided country. One measure of how thoroughly the electorate had changed by the time of Obama’s election was that, if college-­educated whites, working-class whites, and minorities had cast the same proportion of the votes in 1988 as they did in 2008, Michael Dukakis would have, just barely, won. By 2020—just eight years away—nonwhite voters should rise from a quarter of the 2008 electorate to one third. In 30 years, nonwhites will outnumber whites. Now, there are two points to keep in mind about the emerging Democratic majority. The first is that no coalition is permanent. One party can build a majority, but eventually the minority learns to adapt to an altered landscape, and parity returns. In 1969, Kevin Phillips, then an obscure Nixon-­administration staffer, wrote The Emerging Republican Majority, arguing that Republicans could undo FDR’s New Deal coalition by exploiting urban strife, the unpopularity of welfare, and the civil-rights struggle to pull blue-collar whites into a new conservative bloc. The result was the modern GOP. Bill Clinton appropriated some elements of this conservative coalition by rehabilitating his party’s image on welfare and crime (though he had a little help from Ross Perot, too). But it wasn’t until Obama was elected that a Democratic president could claim to be the leader of a true majority party. The second point is that short-term shocks, like war, recession, or scandal, can exert a far more powerful influence than a long-term trend: The Watergate scandal, for instance, interrupted the Republican majority at its zenith, helping elect a huge raft of Democratic congressmen in 1974, followed two years later by Jimmy Carter. But the dominant fact of the new Democratic majority is that it has begun to overturn the racial dynamics that have governed American politics for five decades. Whatever its abstract intellectual roots, conservatism has since at least the sixties drawn its political strength by appealing to heartland identity politics. In 1985, Stanley Greenberg, then a political scientist, immersed himself in Macomb County, a blue-collar Detroit suburb where whites had abandoned the Democratic Party in droves. He found that the Reagan Democrats there understood politics almost entirely in racial terms, translating any Democratic appeal to economic justice as taking their money to subsidize the black underclass. And it didn’t end with the Reagan era. 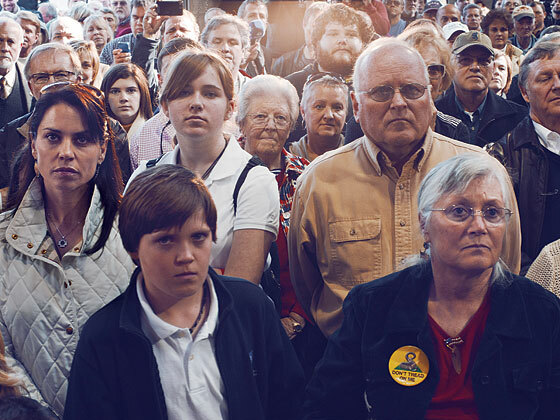 Piles of recent studies have found that voters often conflate “social” and “economic” issues. What social scientists delicately call “ethnocentrism” and “racial resentment” and “ingroup solidarity” are defining attributes of conservative voting behavior, and help organize a familiar if not necessarily rational coalition of ideological interests. Doctrines like neoconservative foreign policy, supply-side economics, and climate skepticism may bear little connection to each other at the level of abstract thought. But boiled down to political sound bites and served up to the voters, they blend into an indistinguishable stew of racial, religious, cultural, and nationalistic identity. Obama’s election dramatized the degree to which this long-standing political dynamic had been flipped on its head. In the aftermath of George McGovern’s 1972 defeat, neoconservative intellectual Jeane Kirk­patrick disdainfully identified his voters as “intellectuals enamored with righteousness and possibility, college students, for whom perfectionism is an occupational hazard; portions of the upper classes freed from concern with economic self-interest,” and so on, curiously neglecting to include racial minorities. All of them were, in essence, people who heard a term like “real American” and understood that in some way it did not apply to them. Today, cosmopolitan liberals may still feel like an embattled sect—they certainly describe their political fights in those terms—but time has transformed their rump minority into a collective majority. As conservative strategists will tell you, there are now more of “them” than “us.” What’s more, the disparity will continue to grow indefinitely. Obama actually lost the over-45-year-old vote in 2008, gaining his entire victory margin from younger voters—more racially diverse, better educated, less religious, and more socially and economically liberal. Portents of this future were surely rendered all the more vivid by the startling reality that the man presiding over the new majority just happened to be, himself, young, urban, hip, and black. When jubilant supporters of Obama gathered in Grant Park on Election Night in 2008, Republicans saw a glimpse of their own political mortality. And a galvanizing picture of just what their new rulers would look like. In the cold calculus of game theory, the expected response to this state of affairs would be to accommodate yourself to the growing strength of the opposing coalition—to persuade pockets of voters on the Democratic margins they might be better served by Republicans. Yet the psychology of decline does not always operate in a straightforward, rational way. A strategy of managing slow decay is unpleasant, and history is replete with instances of leaders who persuaded themselves of the opposite of the obvious conclusion. Rather than adjust themselves to their slowly weakening position, they chose instead to stage a decisive confrontation. If the terms of the fight grow more unfavorable with every passing year, well, all the more reason to have the fight sooner. This was the thought process of the antebellum southern states, sizing up the growing population and industrial might of the North. It was the thinking of the leaders of Austria-Hungary, watching their empire deteriorate and deciding they needed a decisive war with Serbia to save themselves. At varying levels of conscious and subconscious thought, this is also the reasoning that has driven Republicans in the Obama era. Surveying the landscape, they have concluded that they must strike quickly and decisively at the opposition before all hope is lost. It’s easy for liberals to ­dismiss these fears as simple racism—and surely racism, to some degree, sways the tea party. But it is not just conservative white people who react fearfully when they ­see themselves ­outnumbered by an influx of people unlike themselves. Minorities do it. White hipsters do it. Recall the embarrassing spectacle of liberal panic, in the aftermath of George W. Bush’s reelection, when Kerry voters believed their country had been taken over by gay-bashing Evangelical Christians. Of course, both parties make use of end-times rhetoric, especially in election season. What’s novel about the current spate of Republican millennialism is that it’s not a mere rhetorical device to rally the faithful, nor even simply an expression of free-­floating terror, but the premise of an electoral strategy. In that light, the most surprising response to the election of 2008 is what did not happen. Following Obama’s win, all sorts of loose talk concerning the Republican predicament filled the air. How would the party recast itself? Where would it move left, how would it find common ground with Obama, what new constituencies would it court? The most widely agreed-upon component of any such undertaking was a concerted effort to win back the Hispanic vote. It seemed like a pure political no-brainer, a vital outreach to an exploding electoral segment that could conceivably be weaned from its Democratic leanings, as had previous generations of Irish and Italian immigrants, without altering the party’s general right-wing thrust on other issues. George W. Bush had tried to cobble together a comprehensive immigration-reform policy only to see it collapse underneath a conservative grassroots revolt, and John McCain, who had initially co-sponsored a bill in the Senate, had to withdraw his support for it in his pursuit of the 2008 nomination. None of this is to say that Republicans ignored the rising tide of younger and browner voters that swamped them at the polls in 2008. Instead they set about keeping as many of them from the polls as possible. The bulk of the campaign has taken the form of throwing up an endless series of tedious bureaucratic impediments to voting in many states—ending same-day voter registration, imposing onerous requirements upon voter-registration drives, and upon voters themselves. “Voting liberal, that’s what kids do,” overshared William O’Brien, the New Hampshire House speaker, who had supported a bill to prohibit college students from voting from their school addresses. What can these desperate, rearguard tactics accomplish? They can make the electorate a bit older, whiter, and less poor. They can, perhaps, buy the Republicans some time. And to what end? The Republicans’ most audacious choice is the hyperaggressive position they’ve adopted against Obama to sabotage his chances for a second term. Frustrated liberals, assessing the methods of the Republicans in Congress, see a devious brilliance at work in the GOP strategy of legislative obstruction. And indeed, Republicans very skillfully ground the legislative gears to a halt for months on end, weakening or killing large chunks of Obama’s agenda, and nurturing public discontent with Washington that they rode to a sweeping victory in 2010. At the same time, their inability to waver from desperate, all-or-nothing opposition often meant conservatives willingly suffered policy defeats for perceived political gain, and failed to minimize the scale of those defeats. Take the fight over health-care reform. Yes, Republicans played the politics about as well as possible. But it was their hard line on compromise allowed the bill to pass: The Democrats only managed to cobble together 60 votes to pass it in the Senate because conservatives drove Arlen Specter out of the GOP, forcing him to switch to the Democratic Party. Without him, Democrats never could have broken a filibuster. When Scott Brown surprisingly won the 2010 race to fill Ted Kennedy’s Senate seat, Democrats were utterly despondent, and many proposed abandoning comprehensive health-care reform to cut a deal for some meager expansion of children’s health insurance. But Republicans refused to offer even an olive branch. Presented with a choice between passing the comprehensive bill they had spent a year cobbling together or collapsing in total ignominious defeat, the Democrats passed the bill. Last summer, Obama was again desperate to reach compromise, this time on legislation to reduce the budget deficit, which had come to dominate the political agenda and symbolize, in the eyes of Establishment opinion, Obama’s failure to fulfill his campaign goal of winning bipartisan cooperation. In extended closed-door negotiations, Obama offered Republicans hundreds of billions of dollars in spending cuts and a permanent extension of Bush-era tax rates in return for just $800 billion in higher revenue over a decade. This was less than half the new revenue proposed by the Bowles-Simpson deficit commission. Republicans spurned this deal, too. Instead the party has bet everything on 2012, preferring a Hail Mary strategy to the slow march of legislative progress. That is the basis of the House Republicans’ otherwise inexplicable choice to vote last spring for a sweeping budget plan that would lock in low taxes, slash spending, and transform Medicare into ­private vouchers—none of which was popular with voters. Majority parties are known to hold unpopular votes occasionally, but holding an ­unpopular vote that Republicans knew full well stood zero chance of enactment (with Obama casting a certain veto) broke new ground in the realm of foolhardiness. The way to make sense of that foolhardiness is that the party has decided to bet everything on its one “last chance.” Not the last chance for the Republican Party to win power—there will be many of those, and over time it will surely learn to compete for nonwhite voters—but its last chance to exercise power in its current form, as a party of anti-government fundamentalism powered by sublimated white Christian identity politics. (And the last chance to stop the policy steamroller of the new Democratic majority.) And whatever rhetorical concessions to moderates and independents the eventual Republican nominee may be tempted to make in the fall, he’ll find himself fairly boxed in by everything he’s already done this winter to please that base. Will the gamble work? Grim though the long-term demography may be, it became apparent to Republicans almost immediately after Obama took office that political fate had handed them an impossibly lucky opportunity. Democrats had come to power almost concurrently with the deepest economic crisis in 80 years, and Republicans quickly seized the tactical advantage, in an effort to leverage the crisis to rewrite their own political fortunes. 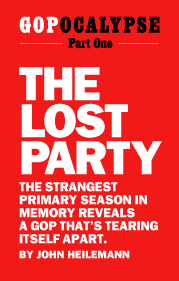 The Lesser Depression could be an economic Watergate, the Republicans understood, an exogenous political shock that would, at least temporarily, overwhelm any deeper trend, and possibly afford the party a chance to permanently associate the Democrats with the painful aftermath of the crisis. During the last midterm elections, the strategy succeeded brilliantly. Republicans moved further right and won a gigantic victory. In the 2010 electorate, the proportion of voters under 30 fell by roughly a third, while the proportion of voters over 65 years old rose by a similar amount—the white share, too. In the long run, though, the GOP has done nothing at all to rehabilitate its deep unpopularity with the public as a whole, and has only further poisoned its standing with Hispanics. But by forswearing compromise, it opened the door to a single shot. The Republicans have gained the House and stand poised to win control of the Senate. If they can claw out a presidential win and hold on to Congress, they will have a glorious two-year window to restore the America they knew and loved, to lock in transformational change, or at least to wrench the status quo so far rightward that it will take Democrats a generation to wrench it back. The cost of any foregone legislative compromises on health care or the deficit would be trivial compared to the enormous gains available to a party in control of all three federal branches. On the other hand, if they lose their bid to unseat Obama, they will have mortgaged their future for nothing at all. And over the last several months, it has appeared increasingly likely that the party’s great all-or-nothing bet may land, ultimately, on nothing. In which case, the Republicans will have turned an unfavorable outlook into a truly bleak one in a fit of panic. The deepest effect of Obama’s election upon the Republicans’ psyche has been to make them truly fear, for the first time since before Ronald Reagan, that the future is against them.